This book is a work of nonfiction and is intended to be factually accurate. INTRODUCTION. Of the Transcendental Faculty of judgement in General. CHAPTER II. System of all Principles of the Pure Understanding. CHAPTER I. 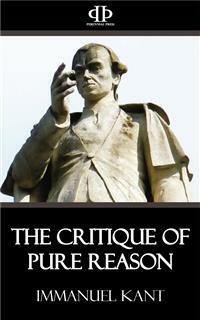 Of the Paralogisms of Pure Reason. Conclusion of the Solution of the Psychological Paralogism. CHAPTER II. The Antinomy of Pure Reason. CHAPTER III. The Ideal of Pure Reason. CHAPTER I. The Discipline of Pure Reason. In this second edition, I have endeavoured, as far as possible, to remove the difficulties and obscurity which, without fault of mine perhaps, have given rise to many misconceptions even among acute thinkers. In the propositions themselves, and in the demonstrations by which they are supported, as well as in the form and the entire plan of the work, I have found nothing to alter; which must be attributed partly to the long examination to which I had subjected the whole before offering it to the public and partly to the nature of the case. For pure speculative reason is an organic structure in which there is nothing isolated or independent, but every Single part is essential to all the rest; and hence, the slightest imperfection, whether defect or positive error, could not fail to betray itself in use. I venture, further, to hope, that this system will maintain the same unalterable character for the future. I am led to entertain this confidence, not by vanity, but by the evidence which the equality of the result affords, when we proceed, first, from the simplest elements up to the complete whole of pure reason and, and then, backwards from the whole to each part. We find that the attempt to make the slightest alteration, in any part, leads inevitably to contradictions, not merely in this system, but in human reason itself. At the same time, there is still much room for improvement in the exposition of the doctrines contained in this work. In the present edition, I have endeavoured to remove misapprehensions of the aesthetical part, especially with regard to the conception of time; to clear away the obscurity which has been found in the deduction of the conceptions of the understanding; to supply the supposed want of sufficient evidence in the demonstration of the principles of the pure understanding; and, lastly, to obviate the misunderstanding of the paralogisms which immediately precede the rational psychology. Beyond this point—the end of the second main division of the “Transcendental Dialectic"—I have not extended my alterations,* partly from want of time, and partly because I am not aware that any portion of the remainder has given rise to misconceptions among intelligent and impartial critics, whom I do not here mention with that praise which is their due, but who will find that their suggestions have been attended to in the work itself.